3 Light RBG/White LED Mini Puck Kit The RK29-LED 'Mini Puck Kit'' offer versatility in a compact form while giving a bright punch of light. Installs quickly with the included driver and snap on connectors. Easily adjust the spacing between the three fixtures up to 48 In. apart on a flat surface. Ideal for under-cabinet, shelving, accent lighting and anywhere else task lighting is required. Can be recessed or surface mounted. This is truly made for the ''Do-it-yourselfer''. 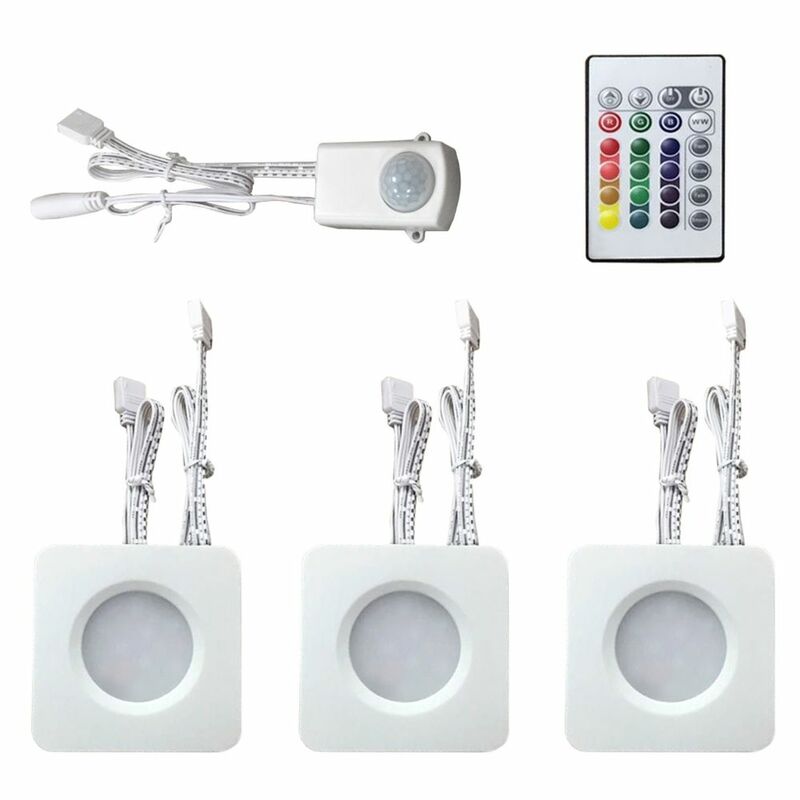 3 Light RBG/White LED Mini Puck Kit is rated 5.0 out of 5 by 1. Rated 5 out of 5 by RockinRog from Perfect Under Counter Install Bought these awhile ago for under my cupboards and installed them last night with ease. They are very bright and yet dimmable to perfect levels plus the color options are actually useful for occasions. I like the warm white they give off as it's not that fake looking bright white some led tend to display! To hide the wiring I bought the Legrand Cordmate C110 cord cover kit at Home Depot which works amazing at producing a factory finish! To give that extra usability I plugged these into a Caseta Wireless Plug-in Dimmer sold here that allows me to turn these off and on from very far away and out of line of sight from the lights included sensor plus the Caseta mounts on the wall like a regular light switch for a professional finish and done wirelessly! Is there an extension available to extend the length from one light to the second or third light, so as to make it easier to accommodate an open space between the cabinets? You can find a 4pin RGB LED extension cable online very easily! I found a 6ft one delivered for under $3. Only the 3 pucks can be hooked together. Are these 12 volt lights ?